Morgan Belcher has been teaching first grade at Starke School in Pekin, IL, for twelve years. Morgan attended Illinois State University for both her bachelor’s (2006) and master’s degrees (2011), with an emphasis on literacy/reading. Morgan began working on her doctoral degree in 2014 and continues her dissertation, focusing her research on mentoring student teachers. 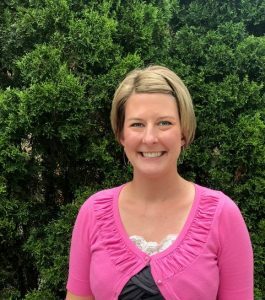 Morgan is a leader in the educational community, is an active member of Central Illinois TAWL, and has presented at national conferences including NCTE, LRA, and NAPDS. Within her classroom, Morgan is interested in providing authentic learning experiences for children, incorporating social justice and technology integration. Purpose: This award honors a preK-12 teacher that inspires authentic progressive literacy learning. Award Specifics: The recipient receives a certificate, Summer Institute registration, and one-year complimentary NCTE/WLU membership presented by the WLU President at the Opening Session during the Literacies for All Summer Institute. The award is presented at the discretion of the WLU Executive Board and at the recommendation of the Awards Committee.